Friends of the NCTC - John D. Chaney, "40 Years from the Brink of Extinction: America's Bald Eagle"
John D. Chaney, "40 Years from the Brink of Extinction: America's Bald Eagle"
American bald eagles and their fight for survival ignited passion in award-winning photographer John D. Chaney. He began documenting America's national bird for future generations when he learned in college that the bald eagle might become extinct. 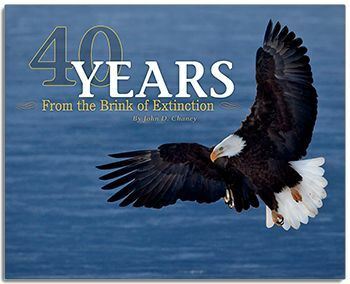 A few years later in 1976 the bald eagle was added to the Endangered Species list. His passion grew year after year as he captured more interesting photographs and finally witnessed first-hand the resurgence of our symbol of freedom. Chaney's images in 40 Years from the Brink of Extinction pay tribute to the eagles' survival and the people who helped them. This large-format hardcover features 63 beautiful photographs of the majestic eagles in their natural habitat, interspersed with interesting facts he learned on his journey. This event is free and open to the public. Registration is not required, however, please register to receive reminders or updates about the event.